You can’t have Summer without watermelon, right? Right! And what better way to enjoy your next party than with this refreshing dessert . . . Introducing the watermelon cake. Forget the super-artificially-sweet chocolate cake varieties and don’t even think about serving up a traditional Summer pav because this Lorna Jane Clarkson masterpiece is all you need to make your Christmas and New Year a memorable one. 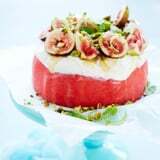 “This cake is one of my favourite things to make when entertaining in summer as it’s fresh, delicious and looks so beautiful piled high with figs and mint — making the perfect Summer table centre piece.” — Lorna Jane Clarkson. Remove skin and rind from watermelon, keeping the flesh as a whole round piece. Using a vegetable peeler, peel rind thinly from the lime. Cut lime rind into long, fine strips. Juice lime; reserve 2 tablespoons juice. Combine lime juice and honey in a small bowl; stir in ricotta. Place watermelon piece on serving plate; spread ricotta mixture on top. Pile figs on top; sprinkle with nuts, mint and lime rind. Drizzle with extra honey before serving, cut into wedges.